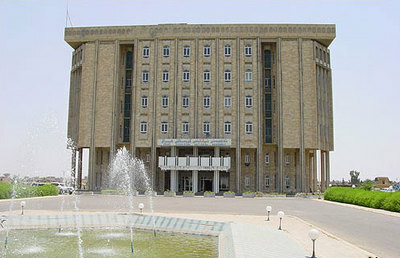 Kurdish Regional Parliament, Erbil, Iraq – Photograph 2005 (c) Hawi Afandi, Via Wikimedia Commons. In June, the parliament of Iraq's autonomous Kurdistan Regional Government (KRG) adopted a ban on domestic violence, including female genital mutilation (FGM), a "procedure" that is widespread among Iraqi Kurds. The law will come into effect once it is signed by KRG president Mesud Barzani, who represents the Kurdistan Democratic Party. But a local cleric, Ismail Sussai, in the major Iraqi Kurdish city of Erbil, has delivered a televised sermon in which he described FGM as "obligatory," called on fathers to kill themselves, on pain of losing their "honor," if they are legally prevented from abusing their daughters for using mobile phones; and he defended the beating of wives and children. The Kurdish cleric was particularly offended by use of mobile phones among girls, as well as by suggestions that the beating of women and children should be legislatively curbed, along with the FGM that was inflicted on the mothers and grandmothers of present-day Iraqi Kurdish leaders, and is still suffered by a majority of Kurdish girls. He went on to threaten political opposition to the KRG if Barzani signs the law against domestic violence and FGM. Sussai's diatribe included the claim that sanctions against FGM were forced on the Iraqi Kurds by a conference of "Jews" in the Chinese capital of Beijing -- a bizarre charge that is apparently based in the condemnation of FGM by the Fourth World Conference on Women hosted by the United Nations in Beijing in 1995. Sussai based his argument for FGM on support for it by the Shafi'i school of Islamic jurisprudence, one of four Sunni schools. While Shafi'i legalists have declared FGM obligatory, its imposition on girls has not been uniform. Shafi'i jurisprudence is widely adhered to in Muslim communities in East Africa, as well as in Egypt and Indonesia, with additional enclaves of support in the other Arab lands, the Indian ocean, and Southeast Asia. But FGM is rare in large areas of the Muslim geographical region that recognizes Shafi'i religious law. FGM is a pre-Islamic practice that appears to have been assimilated into Shafi'i jurisprudence through adoption of local customs. It is more common among Black Africans of differing religious affiliation, as well as Arabs in diverse areas of Saudi Arabia and its neighbours, including Egypt. Immigrants from both parts of the globe have introduced FGM into Europe and the U.S., where it is banned. Parents who insist on it may send their daughters back to their homelands for infliction of FGM, but in doing so violate the law. Along with many Western countries, Indonesia and Egypt have prohibited FGM, although some extremist clerics in both countries emphasize their support for it in the style of the Kurdish Ismail Sussai. FGM is unknown in the Muslim Balkans, rare in Turkey and Central Asia, and absent from India and Bangladesh. The custom is controversial and despised by most of the Islamic global community. Even the radical cleric Yusuf al-Qaradawi, who is influential in Egypt, has averred that while he supports the practice in a "moderate" Islamic way "indicated" in some of the hadiths (oral commentaries) of Prophet Muhammad, "such hadiths are not confirmed to be authentic." Muslims should work to end FGM, so-called "honour" murders, beatings, and other abuses imposed on women and children under cover of religion. With all its many problems, the intentions of Barzani's Kurdistan Democratic Party (KDP), which has a secular history, and of the Kurdistan Regional Government, are correct in banning these practices. President Barzani should sign and enforce the law against domestic violence, including its anti-FGM components, and disregard the retrograde harangues of extremist clerics like Ismail Sussai. But members of the Shafi'i school and non-Shafi'i Muslim clerics must also recognize a duty to unambiguously repudiate "Islamic" pretexts for FGM and other family crimes.